Today is my birthday! Normally I would do a post showing some form of a birthday cake, but instead today I am sharing with you a healthy snack for kids of all ages. Our mission for #SundaySupper is to save summer! I will do my best to save summer, so I thought what is one of my favorite summertime food that I would love to eat all year? My first thought was strawberries, but then I thought hmmmmm…. blueberries. 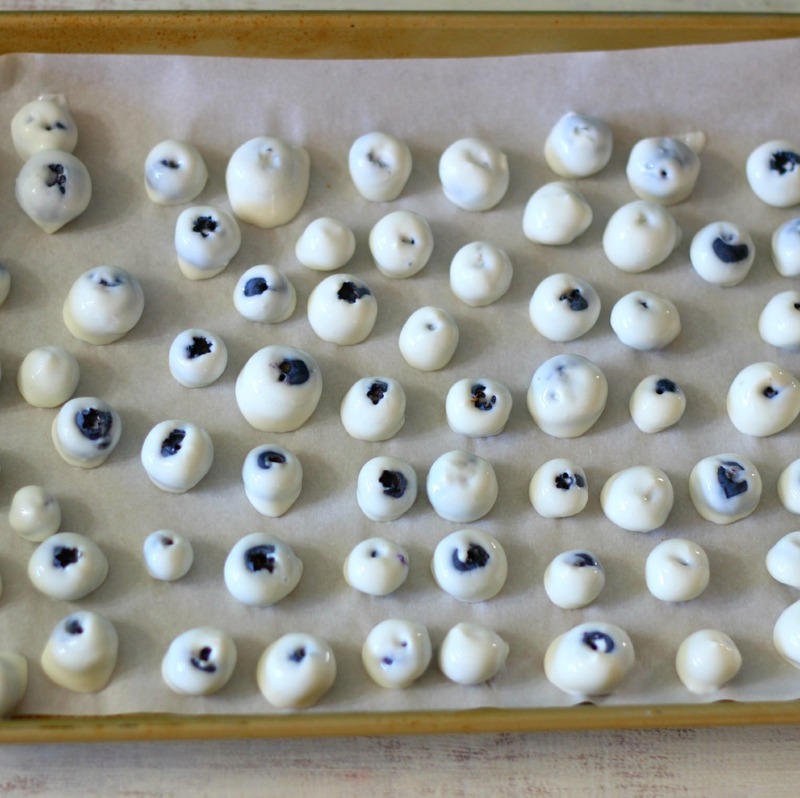 So with blueberries on the brain, I decided to make Frozen Yogurt Covered Blueberries. Yummers! The perfect after school or work treat. 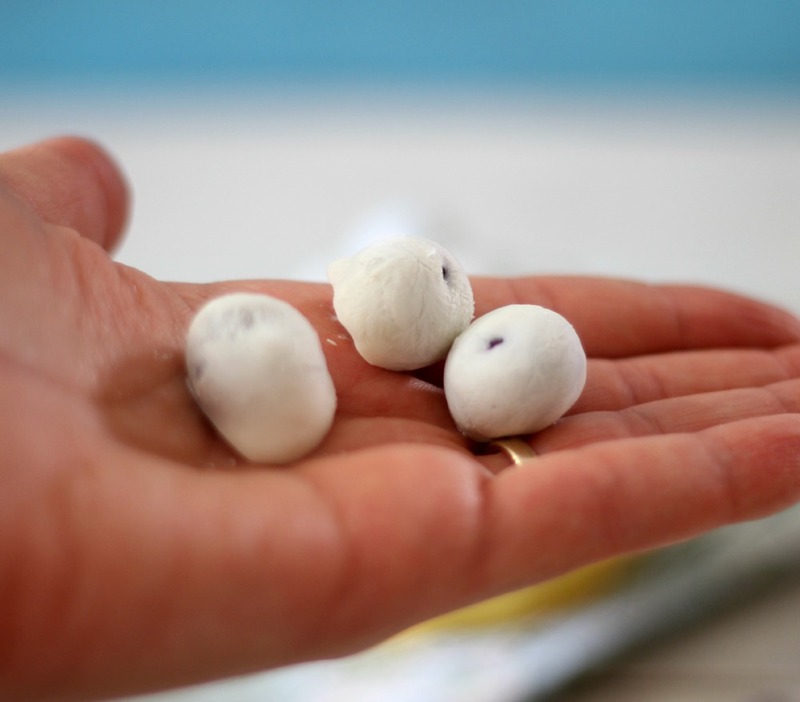 These blueberry treats are sweet, easy to make, fun to eat and I simply love popping them in my mouth. 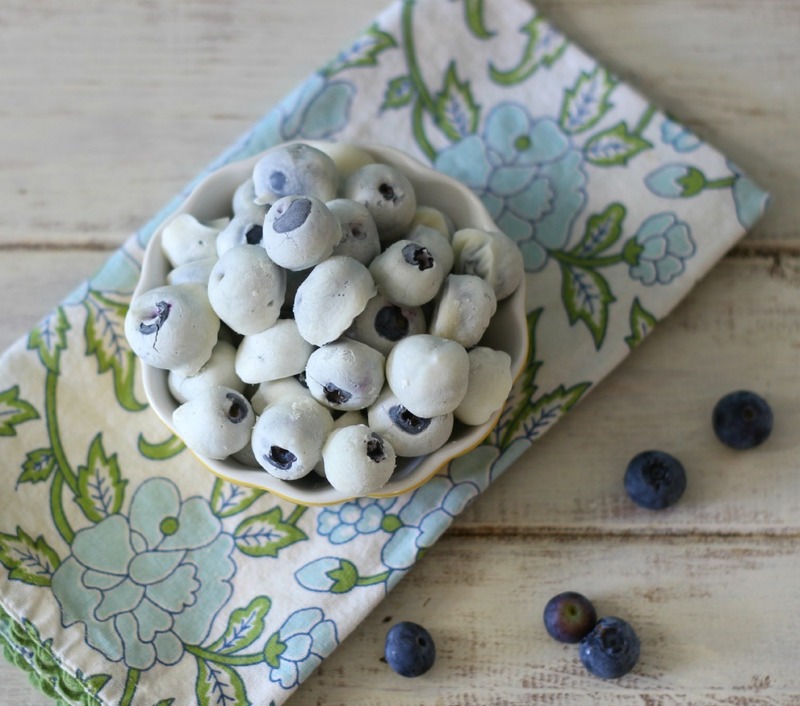 They are made with two ingredients, greek yogurt and blueberries. You can’t go wrong with that combo. 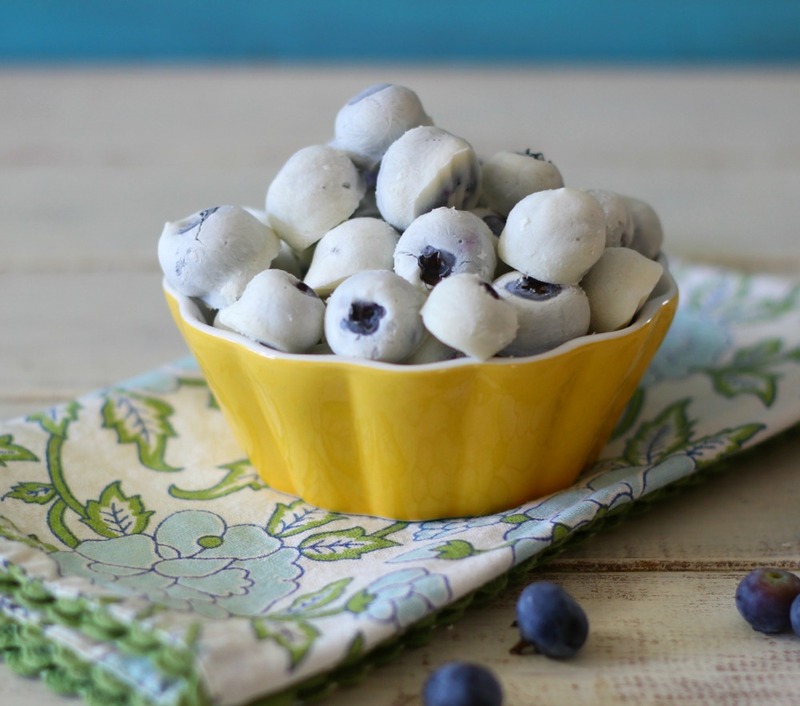 I eat blueberries and yogurt together all of the time and I thought, they make yogurt covered nuts and fruit, why not try to make a frozen version with fresh yogurt and fresh fruit? I am so glad I made this, it’s an amazing guilt free snack. To make them, I took my half baking sheet and lined it with parchment paper. Took a tooth pick and poked it in the blueberry and swirled it around the yogurt. I placed it on my baking sheet and then put it in the freezer to freeze for about an hour. Here is what they looked liked once I completed covering all of the blueberries. After I froze the berries I popped them in a freezer safe bag for easy grabbing and easy snacking. This really makes a great, healthy snack for kids, but even better for me. I come home from work and grab a tiny handful of my blueberries, which satisfies me until dinner. 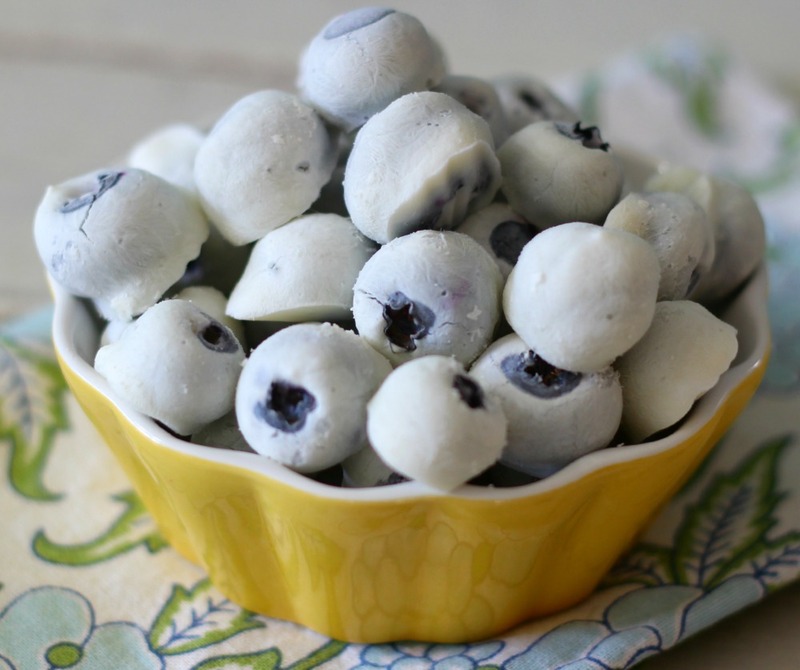 A light healthy, frozen snack made with vanilla greek yogurt and fresh blueberries. I am not calculating calories on this recipe because it is completely healthy. For this recipe, you can also use vegan yogurt, coconut yogurt or your favorite kind of yogurt. Maybe go all crazy and try blueberry flavor or chocolate flavor. I am personally kind of partial to vanilla. I am totally looking forward to today’s #SundaySupper recipe because I want to know how I can preserve the summer. Going to make these…look yummy. Happy birthday!!!! Now imagine how good these would be ON TOP of a cake! Thank you Mallory! That is a great idea for having this on a cake! I love it! Hope it’s a special one. These look absolutely fantastic and I’m with Mallory, these sound SO good on top of a cake!! Thank you Nicole! Yeah, never thought of this for a cake. Happy Birthday! And what a wonderful snack you shared. So simple and healthy and yummy too! Happy Birthday, Jennifer! I hope you have an amazing day! These blueberries are such a good idea. The perfect snack! I love blueberries and I love yogurt covered fruit even more. Great idea! I love this Jen. 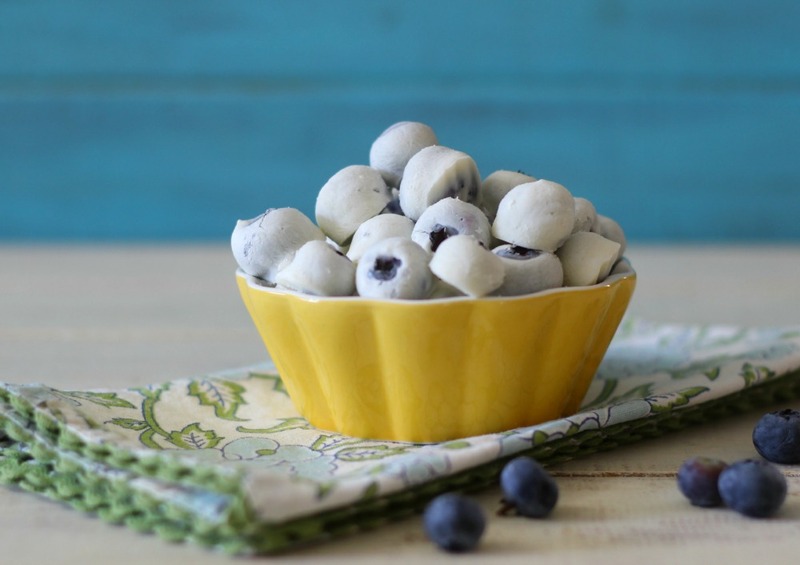 So easy and a great way to enjoy blueberries after the summer season. A healthy carb combined with a healthy protein. PERFECT. Happy, Happy Birthday!! Those look amazing and I would eat the entire bowl!! How easy is this!? So perfect for a quick snack. And I love the idea of experimenting with different yogurts like coconut yogurt! GREAT post. Happy Birthday!! And what a delicious, healthy, pretty snack to celebrate with! What a divine recipe!! The blueberry and yogurt look positively delicious!!! SUCH a good idea! Will try it with the kidlets! Genius, Jennifer! I can almost taste these cool little bites! Happy birthday to you! I would never have thought these would be so simple to make. Heading out to get some blueberries now! this is totally a project for my tots!! 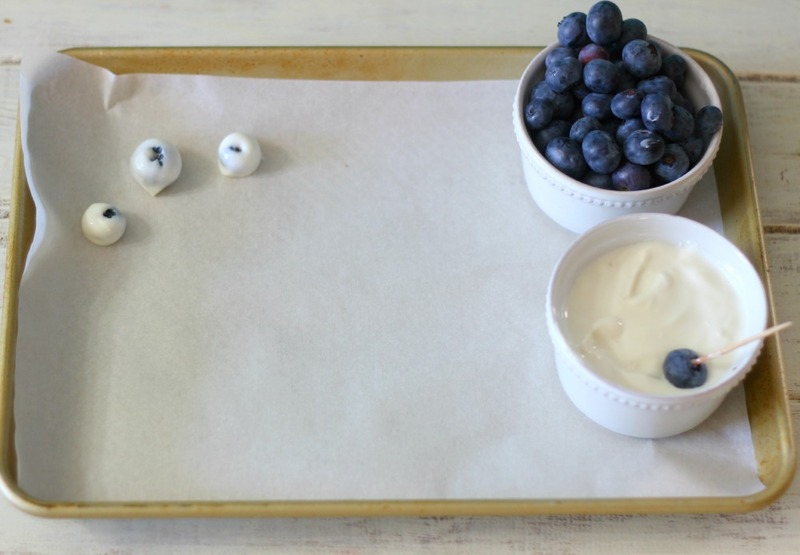 : ) they love both, blueberries AND yogurt and of course, cooking… so this is perfect!! : ) thanks for sharing! What a fabulous healthy snack!! I am going to make some of these ASAP!